Track planning in S is not much different than in other scales. The “real people space” requirements remain the same; only the size of the structures and the curvature of the track are significantly different. Most of us don’t have more than a few city blocks worth of scale real estate to build our empire within, no matter the scale. The use of grades and multiple levels of track will increase both the apparent size of the railroad and the run lengths. Hidden storage/staging tracks allow room for more rolling stock without clogging the visible railroad. Picking an era will limit your purchases of rolling stock, vehicles, structures, and figures. Pick a climatology and season to limit your scenery purchases. In S, the most available rolling stock fits the steam-to-diesel transition timeframe. More “modern era” rolling stock is coming out all the time, if that’s your preference. 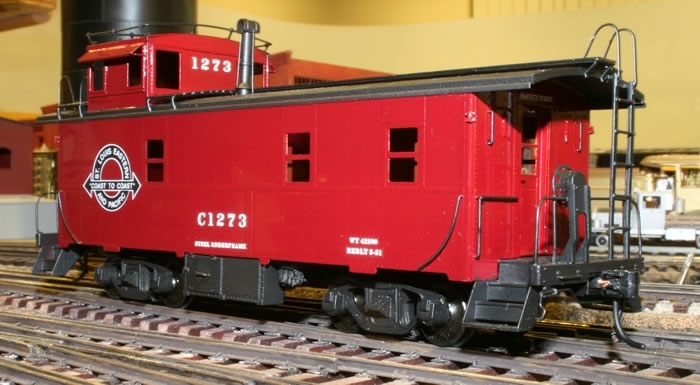 You can use the S-Scale Yahoo group, the NASG website, the S Scale SIG, and even eBay to learn about new products and to find older, out-of-production items. Working with the manufacturers and buying direct is a common practice in S. Some manufacturers will make special-run products for you if you buy the entire production run, which you can then sell yourself. Many S scale modelers have gotten what they want this way. 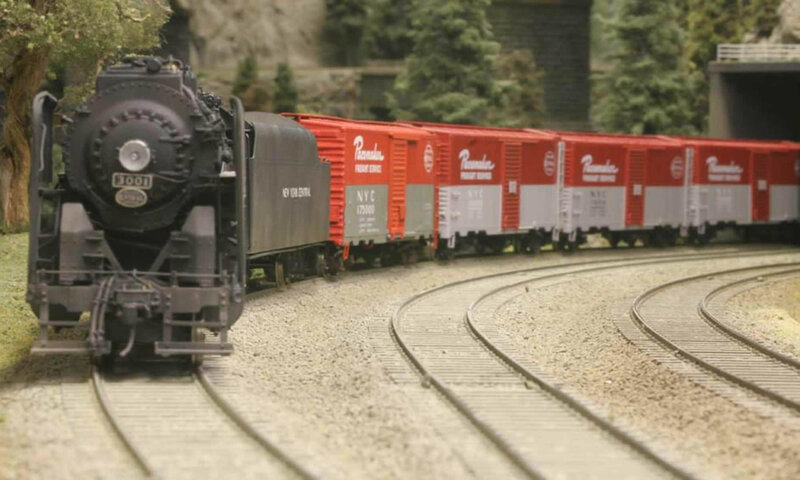 The S scale narrow gauge option, both Sn3 and Sn2, require only a bit more space than the typical HO railroad because only the structures are larger. Sn3 enjoys a large following because of its closeness in size to HO standard gauge and its superior running qualities as compared to HOn3. It’s generally available all of the time, and there are several manufacturers of matching structure kits. If you have steam locos, try to have a “family look.” The Daylight GS-4 is a great model, but it screams Southern Pacific, as does a cab-forward articulated. Changing the paint job and lettering doesn’t really make it non-SP. I have swapped tenders behind my locos to visually take away their actual heritage and simultaneously make them look like they all came from the same railroad design department. For example, the loco in the photo is actually an SP 2-10-2, but I put a NYC tender behind it to obscure its real heritage. The 2-8-0s in the next photo are MP locos, but I put USRA tenders behind them. Note how the common shape of the tender helps to make all these locos look like they came from the same railroad, rather than their original background. Diesels are much easier to integrate into a fictitious environment. Many different diesels are available in S, from lowly switchers to passenger Es and PAs. Again, try not to get too crazy on the colors and paint schemes. Look to the real thing for guidance. Cabooses should also have a common look, though they don’t all have to be identical. I happen to use American Models’ wood cabooses, SouthWind ATSF cabooses, and Division Point D&RGW cabooses. These all have the common design point of having the cupola near the end of the caboose rather than the center, so can easily pass as being purchased at different times but having the same design heritage. Freight cars should be of a common variety for the most part. The Milwaukee rib-side cars weren’t really used by other railroads, though the PRR round-roof cars were. Of course, if your railroad interchanges with the outside world, having cars decorated for the real railroads is okay, but it’s also okay to have some of the other private road name cars on your railroad as well. This is a definite plus for those of us who have some of the NMRA “heritage” cars or other special-issue rolling stock that would look out of place on a railroad that purports to be the Southern Pacific. Additionally, having a car that isn’t a “rivet-counter accurate” model of the prototype, but is still a nice model, is no big deal because it’s a good model for your private road! 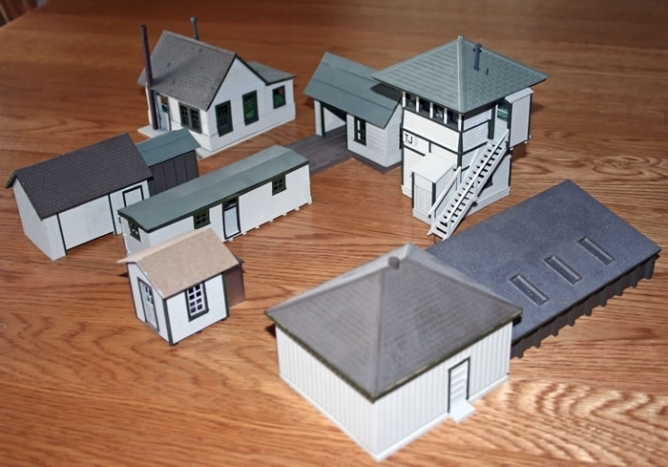 Lastly, the railroad-owned buildings should have a common paint scheme to help identify them with the railroad. Try to use structures that are typical of the region being modeled. Although there are many structure manufacturers in S, scratch-building structures in S is quite easy. The units of measure are on every common ruler, and they are not a mixture of metric and English. Every scale inch is simply a real sixty-fourth of an inch. Therefore, stripwood, sheet wood and plastic modeling materials don’t have to be custom-cut for S scale. You can find these materials at any craft or hobby store. One of the big plusses for S scale is the excellent running quality of the motive power. You can put this to use in your track planning for either a large or small layout. Switching layouts benefit from smooth, stall-free operation. Larger layouts enjoy the realistic starts, stops and pulling capability, letting one “railfan” his or her own railroad. Putting your own stamp on your trains with a personal road name only makes all this that much better.